It's More than You Think. People Generally Use Only 1/4 of What Is Required. Sunscreens are tested using a thick coating on the skin, but the typical person puts on just a fraction of this. To make sure you are using enough, apply from ½ teaspoon to 1 teaspoon to your face and neck every 2 hours that you are in the sun, and a total of 6-9 teaspoons, or the equivalent of a shot glass, to your entire body. Other factors, such as the time of day, intensity of the sun, and the time of year can change the amount of protection you get, so be extra conscious to use plenty of sunscreen during midday hours during the summer. The way most sunscreen protects is by absorbing to the sun's rays, and this reaction slowly reduces the ability of the sunscreen to do its job. After 2 hours of sun exposure, most sunscreens will lose their ability to protect the skin, so reapply sunscreen after 2 hours of sun exposure. And if you end up toweling off, and rub the sunscreen off your skin, you'll need to reapply immediately. Your skin is the largest organ in your body, and it is directly exposed to the sun's ultraviolet (UV) rays, so it is important to do what you can to shield against damage.1 Sunscreen can help, but for the most part, people do not apply enough--far less than they need to get the protection advertised on the label--and they forget to reapply. The recommended dose of sunscreen is 2 milligrams per square centimeter of exposed skin.2 At this concentration, the average adult needs a little more than a ½ teaspoon (3mL) to cover their face and neck, and 6 or 7 teaspoons (33mL) to cover their entire body. But getting too much sun has major downsides. A sunburn is skin damage, and anything that damages the skin can bite back with acne in the weeks following. This is why people often notice a breakout a week or two after getting a sunburn. Too much UV radiation can also cause skin cancer.1,6 Also, in rare cases, UV rays can weaken their immune systems, produce allergic reactions, or make certain skin symptoms worse, as in the case of lupus. UVA light is the longest wavelength light and penetrates the deepest into the skin. It is responsible for most of the sun-caused premature aging symptoms like sagging and wrinkling. 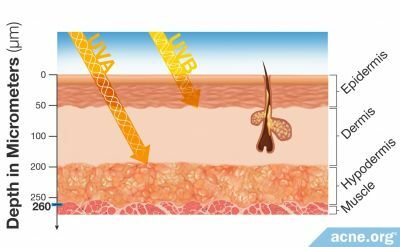 UVB light is responsible for most of the burning in a sunburn, and can cause hyperpigmentation (red/dark marks that linger after an acne lesion heals). UVC light does not make it to Earth because it is blocked by the ozone layer, so it cannot hurt you. Because of these dangers, physicians recommend you always protect your skin from the sun, starting early in life. And with sunscreen, that means not skimping. Time of day: Typically, the sun's rays are most intense at midday. For instance, 10 minutes of sun exposure at noon may be equivalent to 40 minutes of sun exposure at 9am. Cloud cover: Clouds will reflect some of the UV radiation, so the same amount of sunscreen can protect you a bit longer on cloudy days. Geographic location: Sun intensity increases the closer you are to the equator. For instance, a sunny day in Mexico will result in more UV exposure than a sunny day in Canada. Skin tone: Fair-skinned people have less melanin in their skin and will naturally absorb more UV radiation than darker-skinned people who have more melanin, which naturally protects the skin from the sun. You might think that a SPF 50 sunscreen is twice as good as one that is SPF 25. But the scale is not linear. In fact, a sunscreen with SPF 15 blocks about 93% of UVB rays, while a sunscreen with SPF 30 blocks only a little bit more, around 97%.1 The SPF 30 sunscreen is more effective, but not as much as you would think. There are countless anecdotal accounts of sunscreens clogging pores and breaking people out. Whether this comes from the active or inactive ingredients in a sunscreen, or a combination of the two, or whether the negative effects come from free radicals that are produced in the skin as the sunscreen absorbs UV rays, remains unknown. 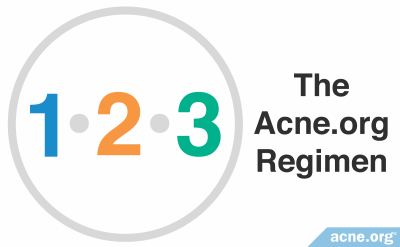 To be safe, if you are acne-prone, using a slightly more moderate SPF value sunscreen of between 15-30, as dermatologists recommend, may be smart. Also, even though you cannot always believe marketing claims, choosing a sunscreen that is "for acne-prone skin" or at the very least claims in writing on the label to be "100% non-comedogenic (won't clog pores)" will at least ensure that you are buying from a company who has thought about the issue, and hopefully (fingers crossed) will mean you're buying from a company who has done comedogenicity testing on their products. 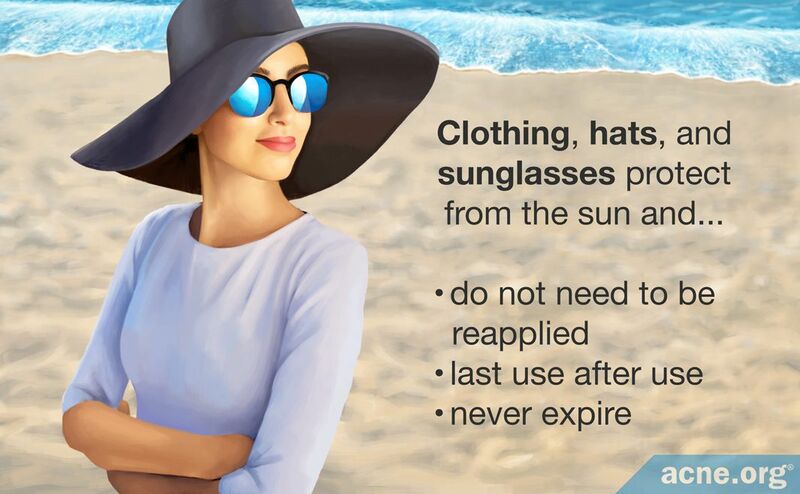 Even if you carefully use the full amount of sunscreen, there are still a couple of important things to consider to make sure you are protected. Dale, Wilson B., Moon, S., & Armstrong, F. (2012). Comprehensive review of ultraviolet radiation and the current status on sunscreens. The Journal of Clinical and Aesthetic Dermatology 5, 18-23. Kaimal, S., & Abraham, A. Sunscreens. (2011). Indian Journal of Dermatology, Venereology and Leprology 77, 238-43. Isedeh, P., Osterwalder, U., Lim, H. W. (2013). 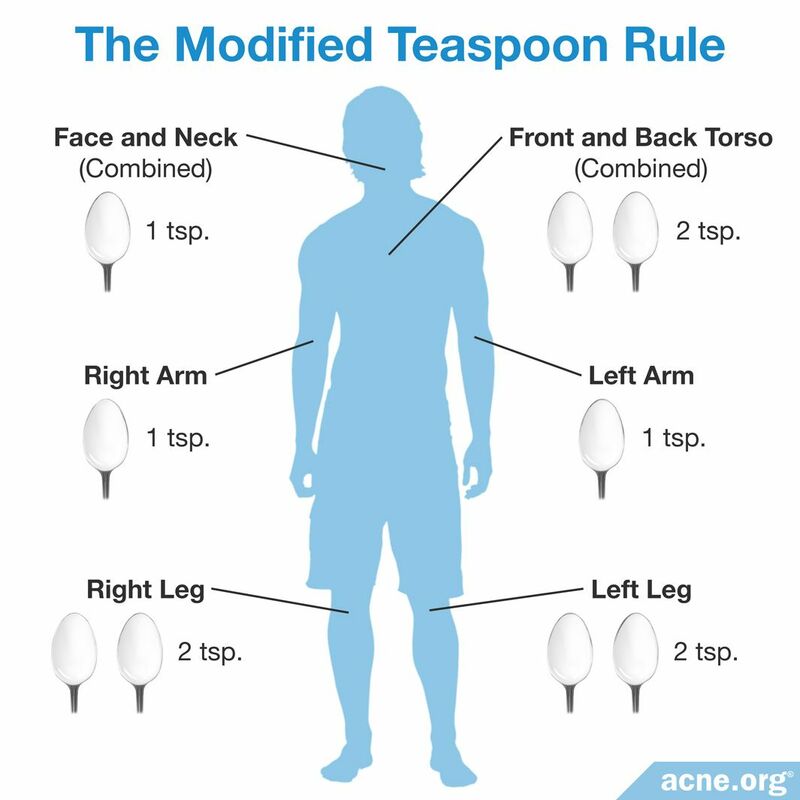 Teaspoon rule revisited: proper amount of sunscreen application. Photodermatology, Photoimmunology & Photomedicine 29, 55-6. Mancebo, S. E., Hu, J. Y., & Wang, S. Q. (2014). Sunscreens: a review of health benefits, regulations, and controversies. Dermatologic Clinics 32, 427-38. Autier P1, Boniol M, Severi G, Doré JF; European Organizatin for Research and Treatment of Cancer Melanoma Co-operative Group (2001). Quantity of sunscreen used by European students. Br J Dermatol. 144(2):288-91. Latha, M. S., Martis, J., Shobha, V., Sham Shinde, R., Bangera, S., Krishnankutty, B., …. Naveen Kumar, B. R. (2013). 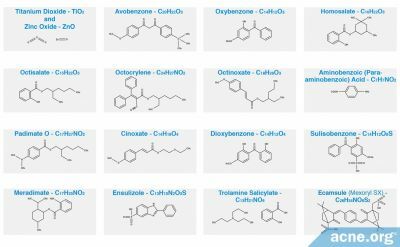 Sunscreening agents: a review. The Journal of Clinical and Aesthetic Dermatology, 6, 16-26. Available from: https://www.fda.gov/aboutfda/centersoffices/officeofmedicalproductsandtobacco/cder/ucm106351.htm. Accessed on 25/09/2017. Available from: https://www.fda.gov/ForConsumers/ConsumerUpdates/ucm239463.htm Accessed on 25/09/2017. 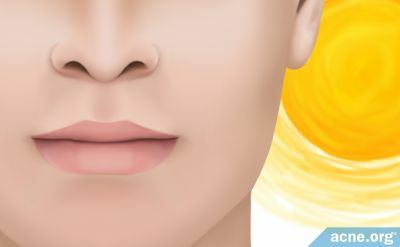 Does the Sun Burn/Tan Your Lips, and Do You Need to Protect Them?